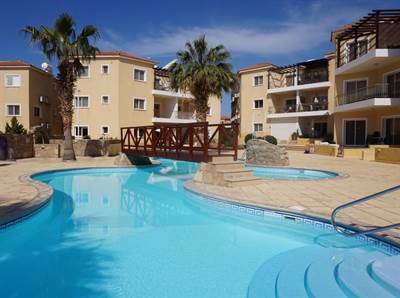 This spacious semi-detached, top floor apartment with 2 bedrooms and 2 bathrooms is located in a popular project in the Kato Paphos area. Both Paphos Town and the touristic amenities of Kato Paphos are a few minute’s drive away, and there is a regular local bus service within easy walking distance. A hallway off the living room leads to two large double bedrooms with fitted wardrobes. The master bedroom has an en-suite shower room and a family size bathroom can be utilised as both an en-suite to bedroom two and/or a guest WC. A centrally located car park has plenty of parking spaces for owners and residents and there is further on-street parking to the rear of the development. The property is ideal as a holiday home and/or rental investment and comes fully furnished. There are full title deeds.